When Jane, a career woman and quiet loner (Bernadette Peters), discovers she has a terminal illness, she has no one to turn to. Her doctor recommends psychologist and friend Wendy Haller (Mary Tyler Moore) to help her come to terms with her diagnosis, and in doing so, helps her open up to others. Soon she has a small but solid group of friends and relatives there with her as she fights against cancer. 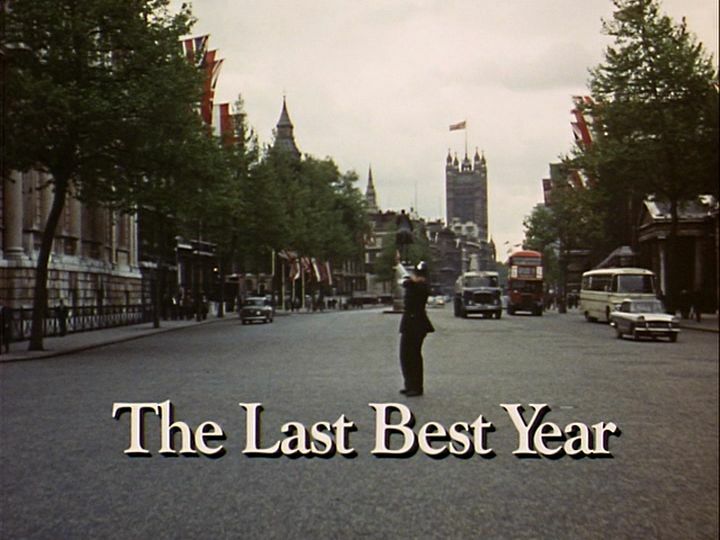 The Last Best Year originally aired on ABC in November of 1990, just at the beginning of the golden era of made-for-TV movies, and was well-received by critics on its release. That said, Ken Tucker’s review makes a good point: it’s fantasy to the point of improbability, and for most people faced with terminal illness, they don’t get pat resolutions or unlimited financial and emotional support. Have you ever wondered what happens to the other patients of the doctors in these films? Wendy spends so much time with Jane that I can’t imagine she has time for anyone else. It’s how we would want to deal with terminal illness if we had the choice, and somehow Jane has that choice, though there is never any explanation why. In real life, how do you even explain something like that? You don’t. In cinema, however, there is always some kind of explanation, usually that the person in question is deserving of a reprieve from death or, at the least, a good death. The Last Best Year is somewhat refreshing in that it doesn’t bother with that kind of insincerity: Jane gets a good year which may be her last, and here it is. Last Best Year also hints heavily at the toll terminal illness takes on the supporters and survivors. Wendy is reluctant to help Jane at first because of her own personal issues; when she was five, her father became seriously ill and was locked away in a room where she was unable to visit him, and only saw him again at his funeral months later. 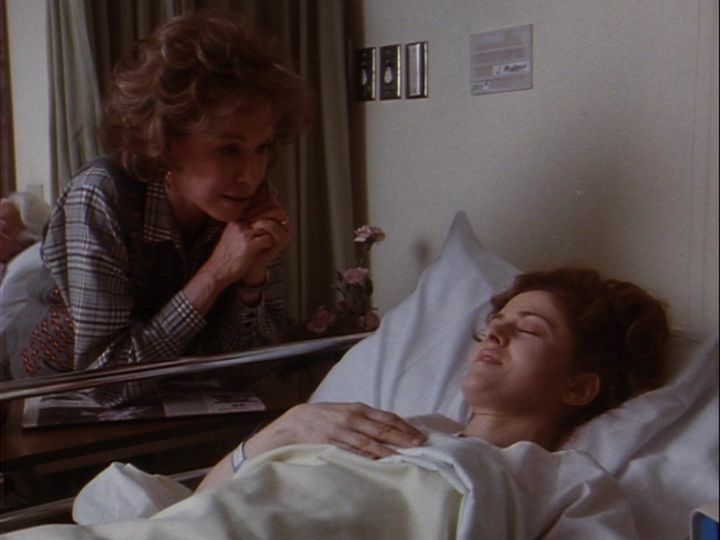 Wendy holds some resentment against her mother (Dorothy McGuire in her final film role) for this, to the point of hallucinating while visiting Jane in the hospital. Actually filmed in Missouri! 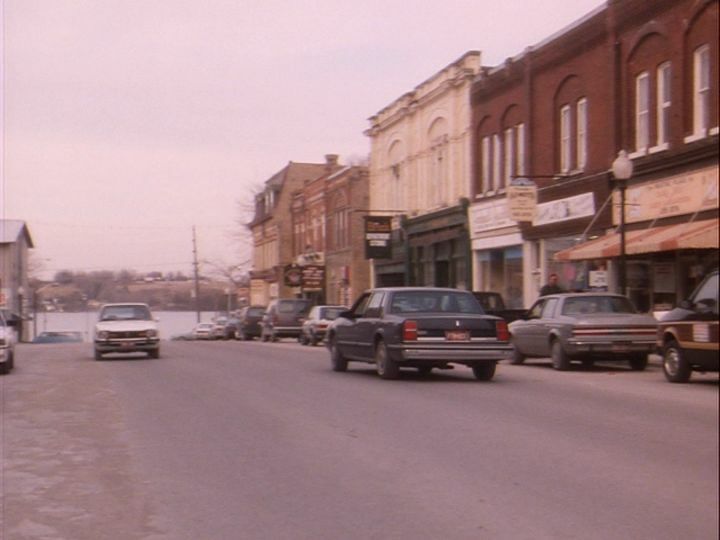 I can’t tell you what town this is despite spending way too much time trying to find out. It’s a small town located just off the river, best I can tell. Hermann, maybe? Parkville? Boonville? 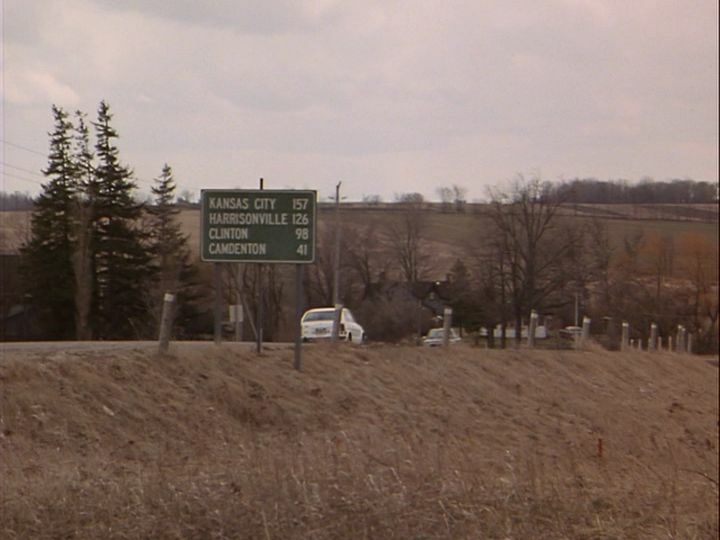 The odd thing is that Jane is later seen driving away on what looks to be Highway 17 near the vast metropolis of Eugene, MO, population 168, but the town isn’t Eugene, and that junction isn’t near any river at all. Why would they drive a few hours away just to get this shot? More Missouri stuff: Jane, a small-town Missouri girl who makes it big in Chicago, pronounces “Missouri” in the Colonel Potter “Mizzur-uh” manner, but doesn’t say it right, which made me chuckle. You gotta really be convinced of that “uh” or you can’t pull it off. The recently departed and still-missed Mary Tyler Moore gives a really great performance in The Last Best Year, the kind of performance that makes you regret she didn’t do more on the silver screen. She would go on to do the television movie sensation Stolen Babies a few years later and earn raves, again, and a few years after that, Flirting With Disaster, which again got raves, all deserved. She’s given a real no-nonsense look in Last Best Year that matches her demeanor, and within a few minutes, you forget you’re watching Mary Tyler Moore. Bernadette Peters, who I love — let’s face it, who everybody loves — isn’t given much of anything, which is a shame. She’s somewhat typically drawn in that she’s the unhappy career woman with the married boyfriend who dumps her the second she’s inconvenient, but she’s also very quiet, subdued and shy, which is an odd thing for the typical Unhappy Career Woman™ character. The only time she gets even close to angry is when it’s suggested she sees a therapist; when she begins to have dinner nights with her secretary Amy (Erika Alexander), she’s astonished at the kinds of things friends tell each other, apparently because she’s never had friends. Have you ever seen a shy, friendless career woman who’s out to wreck marriages before? Neither have I, and it’s that kind of characterization in the film that really makes it work. As John Leonard wrote in his New York Magazine review, The Last Best Year is all about manipulating you with its tearjerker tropes. And boy, does it jerk those tears, but it’s also interesting and different enough to make you perfectly happy to cry on cue. It’s also a little weird. Some of Jane’s nightmares resemble a Celine Dion-slash-Meat Loaf video. That’s not a complaint; I actually like it. Olive Films has just released The Last Best Year on DVD in a fantastic print. It’s mostly bare bones but comes with English subtitles that are quite good. Directed by veteran television director John Erman, written by David “Not Without My Daughter” W. Rintels, music by John Morris, who scored and conducted all of Mel Brooks’ 1970s films, and shot by Frank Tidy, responsible for the sleek dazzling veneer in the Chuck Norris classic Code of Silence.